It can often be difficult to tell what your car is leaking. The leak location, the color and smell of the fluid are some of the best indications of what your vehicle is leaking. Power steering fluid can be one of the most difficult leaks to diagnose. The Power steering system consists mainly of the pump, which is bolted to the motor, a feed and return line, sometimes a cooler and the power steering rack or gear. The difficulty is that if any of these components are leaking it is difficult to tell if it is the power steering system or an engine oil leak. The power steering pump is usually bolted to the motor below the valve cover and a valve cover leak and power steering pump leak could cause drips in the same places. Also, the power steering lines usually are run near the motor or over the back of it depending on the orientation of the engine. The steer rack also needs to be mounted between your front tires so in most vehicles is under the motor, again making it difficult to see if it is the power steering system or engine oil that is leaking. 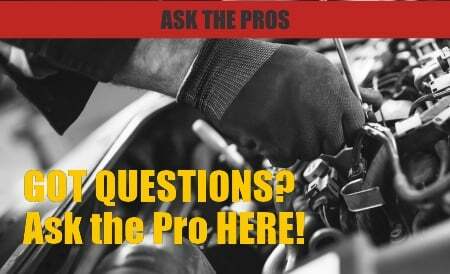 How do you know if your vehicle has a power steering leak? Another method of proving you have a leaking power steering system is to determine what sort of fluid you have dripping from your vehicle. First you must determine what type of fluid your power steering system uses. It seems intuitive that it would take power steering fluid, but if things on cars were always that simple, dealerships wouldn’t be able to charge so much for repairs. Depending on the make, model and year of your vehicle your power steering system could take any variety of different fluids. Each of these fluids have different characteristics and were designed to work in different environments. Most Power steering fluids will not have the same level of friction modifying chemicals or lubricants as transmission fluid and may cause premature failure of your power steering system if incorrectly substituted. Automatic transmission fluids are often used in power steering systems because they maintain a relatively consistence viscosity throughout a wide temperature range ensuring things will work properly even at colder temperatures. Lastly, these different fluids are designed to lubricate and inhibit corrosion with different kinds of materials. Some fluids work well with polymers and exotic metals while other will have harsh reactions with the same materials. The bottom line is that it is very important to refill your power steering system with the manufacture’s recommended fluid. The system likely will work for a short time with the wrong fluid but premature failure will soon follow. The best way to prove you have a power steering leak is to keep track of the power steering fluid level. Most power steering reservoirs will have a dip stick attached to the bottom of the cap. Check the power steering fluid reseviour level every few days using this dip stick. If you notice it dropping consistently, you have a power steering fluid leak. How do you fix a power steering leak? To seal the leak, pick up BlueDevil Power Steering Leak Stop and add 1/3 of the bottle to the power steering reservoir and top off with the proper type of fluid. It may require a day or two of driving, but BlueDevil will stop your power steering leak quickly and permanently guaranteed! Would BlueDevil Power Steering Leak Stop be safe to use in my 1997 Chevy Suburban’s power steering system ? Yes, BlueDevil Power Steering Stop Leak is compatible and safe to use in your Chevy Suburban. Yes, you would have the power steering fluid in the system almost to capacity, leaving just enough room for the recommended amount of the product. Feel free to contact our technical support line at 888-863-0426 with any other questions. 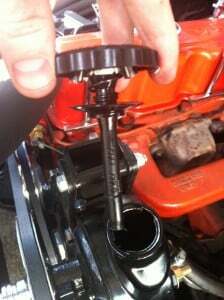 To start, you will add 1/3 of the BlueDevil Power Steering Stop Leak into the power steering reservoir. Typically, you should expect to see results after about 100-200 miles of driving. If you get to around 200 miles of driving and are still experiencing a leak, you would be able to add another 1/3 of the bottle into the power steering reservoir. You may top it off with power steering fluid as needed. We had a leak in the power steering in my wife’s 2008 tsx with 30k miles on the car. The plastic reservoir split. So check this out before the shady car service reps tell you that you have major problems costing hundreds of dollars. They may be ripping you off. Typically, you would need to be able to drive the vehicle in order to achieve results. Please contact our technical support line at 888-863-0426 so that we can get a little better understanding of the vehicle’s condition and be able to make any appropriate recommendations. I use atf fluid for power steering fluid do I use power steering stop leak or automatic transmission fluid stop leak? You should add 1/3 of the BlueDevil Power Steering Stop Leak to your power steering reservoir. I have a 2004 dodge ram 1500. Would the leak stop work if the leak is from one of lines running from my power steering pump? I also use atf-4 fluid. Unfortunately, the BlueDevil Power Steering Stop Leak is not intended to fix leaks that are coming from the actual pump. We recommend having it replaced. Nice article. I have a brand Mustang II IFS kit. I have only 7000 miles on my rebuilt engine along with the IFS, for whatever reason,, a leak has developed on the driver side. My power pump says to use Automatic trans fluid. Is your opinion of Blue Devil biased? I purchased 2 bottles of Lucas Oil Stop leak, along with regular power fluid, and its still leaking. So i say all that to say, should i have purchased the Auto trans fluid, and Lucas Stop Leak, or Auto trans fluid and Blue Devil? Of course i didnt know until after my purchase, to Google. The correct product to use for this leak would be the BlueDevil Power Steering Stop Leak; you would need to add 1/3 of the bottle. I have an 09 370z with a leak from a power steering gasket or seal. With this product take care of this leak? Yes, add 1/3 of the bottle of BlueDevil Power Steering Stop Leak. Once the BlueDevil is added the leak should be stopped after about 100 miles of driving. Yes, the BlueDevil Power Steering Stop Leak is safe and compatible to use in your Chevy Malibu. You will start by adding 1/3 of the bottle into the power steering reservoir, and should expect to start seeing results after approximately 100-200 miles of driving. Please contact us at 888-863-0426 so that we can get a better understanding on how large the leak is. How about and 2000 Impala? My power steering would go out in a couple hours.. Thank you for asking about your Chevy Impala. Based on your description, you may be losing fluid a little to quickly for the BlueDevil Power Steering Stop Leak to be effective. Typically, you would start to see improvement after about 100-200 miles of driving. If you are losing fluid too quickly, you would probably be losing the product just as quickly, and wouldn’t really be able to keep it in the system long enough in order to get the benefit of using it. A hard part repair may be your best option. What could it be with it losing the power steering fluid within a mile or less and having to refill the power steering fluid every time you drive it and park it, Our 2006 dodge caravan had a slow leak for almost a month then we drove it early one morning and it drove fine but when we got back in it after a couple of hours of it sitting it literally starting the hard steering and loud noise and the leak turned into a instant fast draining…What could of happened and how much would it cost to fix it ? Thank you for asking about your Dodge Caravan. From the sounds of it, the slow leak you had, over time, has developed into a larger leak. It is difficult to say exactly where the leak is coming from based on your description. We recommend bringing the vehicle to an ASE certified mechanic for a proper diagnosis. Will it work in my 07 bmw 328i ? Yes, the BlueDevil Power Steering Stop Leak is compatible and safe to use in your BMW 328i. Feel free to contact our technical support line at 888-863-0426 with any other questions. I have a 2002 Nissan Altima 3.5 SE. And i noticed that I am adding power steering fluid to my car at least twice a month. Could BlueDevil stop leak be the answer to my problem? Yes, we recommend adding 1/3 of a bottle of BlueDevil Power Steering Stop Leak. You should notice results after about 100 miles of driving. If the power steering fluid is coming out almost as quickly as you pour it in then it may just be a leak that is a little bit too large for this to work properly. If you aren’t 100% sure on how bad the leak is then contact our tech support team at 888-863-0426 so that we may give you the best recommendation. I have an volvo penta outdrive that has trim cylinders that are leaking it calls for Dexron ATF, Which stop leak would work for this? You should use the BlueDevil Transmission Sealer. Add 1 ounce of BlueDevil per 1 quart of fluid capacity. Hi, did this work for you? What were the symptoms, my penta sx drive very slowly loses it’s trim while underway. Feel free to contact our technical support line at 888-863-0426 if you run into any questions. I have suzuki steem is leaking into the pump power sterring uses Dexron ATF MERCON products recommended to me to seal the leak? We recommend adding 1/3 of a bottle of the BlueDevil Power Steering Stop Leak. You should notice results after about 100 miles of driving. Yes, the BlueDevil Power Steering Stop Leak is safe and compatible to use in your VW. We recommend adding about 1/3 of the bottle to treat the system. You should notice results after about 100 miles of driving. Thank you for asking about your Hyundai. The BlueDevil Power Steering Stop Leak is intended for use when the leak is seeping or dripping out. You may be losing fluid a little too quickly for the product. Feel free to contact our technical support line at 888-863-0426, so that we can discuss the vehicle in more detail. We have a leak on our kia Sorrento, we are pretty sure it is power steering fluid, the year is 2009 , also I have heard a rattling in the car, near the steering wheel, also heard whining sound for a while, we have been checking the fluid and it is going down gradually,but still above the minimum level, but seems to have worsened this weekend. Any suggestion please.? When the power steering level is either too full or drops below the “full” mark your steering can start to act up. We recommend adding 1/3 of a bottle of the BlueDevil Power Steering Stop Leak and then topping your power steering fluid (with the factory recommended brand) off to the proper level. This should alleviate your current steering symptoms and also stop them from happening in the future as the BlueDevil will seal any leaks within the system. My Toyota corolla( AE110) car having a small oil leakage from Rack. And Im filling the reservoir once a week so dont think rack should be replaced immediatley . Will your product( blue Devil) able to stop this leak? And how it will long lasting to ? We recommend adding 1/3 of a bottle of the BlueDevil Power Steering Stop Leak. This should help stop the leak in your power steering and prevent you from having to continually add fluid. Running the system with low fluid could potentially cause further issues. I use a Toyota Corolla 1998 (1.6 GL) which has a power steering fluid leak, though I have not identified the exact spot of the leak, it appears to be somewhere on the rack cause the it leaks on the mat on the driver side, can the BDP steering stop leak be the answer to the problem? Yes, we recommend adding 1/3 of a bottle of the BlueDevil Power Steering Stop Leak. This should have no problem stopping the leak you are experiencing. You should notice results after about 100 miles of driving. I have 2001 ford taurus. I have put steering wheel fluid in my car. Within 2 weeks it seems drained. I possibly have a leaked. Will blue devil stop this problem? Yes, the BlueDevil Power Steering Stop Leak is designed to stop leaks coming from the power steering seals & gaskets. We recommend adding 1/3 of a bottle of the BlueDevil Pwer Steering Stop Leak. You should notice results after about 100 miles of driving. Power steering leak for a 2007 nissan murano? We recommend adding 1/3 of a bottle of the BlueDevil Power Steering Stop Leak to help stop your power steering fluid loss. You should notice results after about 100 miles of driving. Unfortunately, There are no power steering lines that run inside your car by your pedals. The only fluid that runs into the cabin of your car is coolant running through your heater core and it will be green or brown and very watery. If this is what is leaking on your pedals use BlueDevil Radiator and Block Sealer (available here: http://store.gobdp.com/radiator-block-sealer-00205/) to seal that leak and keep your feet dry. I have a 2005 toyota civic. Very slow power steering fluid leak. Finally saw today where it is leaking. There are two (2) very small pinhead leaks on the top of the pressure power steering hose. When you wipe the hose clean, within a few seconds you see a tiny bit of fluid begin to seep out. Will your product seal these very small leaks in the pressure hose? Thanks!! Unfortunately, the BlueDevil Power Steering Stop Leak is not intended to stop fluid loss coming from a hose. The BlueDevil Power Steering Stop Leak is specifically designed to stop fluid loss from the rubber seals/gaskets. We recommend having the hose(s) replaced to remedy the problem. I have a 1999 Pontiac Grand Prix and everytime I put power steering fluid in my car it goes out the same exact day… So will the bluedevil work or do I need to go get it looked at? Unfortunately, it sounds like you have a leak that is too large for what BlueDevil is intended to fix. We recommend having it looked at by a certified mechanic. The BlueDevil Power Steering Stop Leak will seal leaks that are seeping or dripping from the power steering system, including the rack and pinion. As long as you are not losing fluid too quickly, you should have no problem sealing up the leak in your Infiniti. power steering fluid is dissipating from pump, but I don’t have a leak. replaced power steering line.drive about 20 miles then fluid is low. Due to the severity of your fluid loss we recommend taking your vehicle into the dealership or a local mechanics shop to be diagnosed. Losing all or most of your fluid within 20 miles is very quick and should be looked into by a certified mechanic. Hi. I noticed my car making a noise when I turn the wheel. When I checked the power steering fluid reservoir it was below the minimum line marker. I refilled it and when I drove home. It started to make the some noise when I turn the steering wheel. Do you think I have a leak and if o can this product help me out. If the power steering fluid was low then it is very likely that you may have a leak. We recommend adding 1/3 of a bottle of the BlueDevil Power Steering Stop Leak. Once the product is added you should start to notice results after about 100 miles of driving. The other concern would be that the power steering pump has gone bad due to being run with low fluid. You may want to have that checked out in the meantime. Yes, the BlueDevil Power Steering Stop Leak is compatible for use in your Audi A4 quattro. Will it work in European cars? Audis? Yes, the BlueDevil Power Steering Stop Leak is compatible with European cars including Audi’s. my car is a 91 Honda accord and its leaking from the power steering tank it self like its being pumped backwards would this seal stop that? or should I go to a mechanic first? Thanks for your question about your Honda Accord. The problem you’re having sounds more like a clogged power steering system so we would recommend having the system flushed by a mechanic before you try our Power Steering Stop Leak. Thank you for asking about your Ford Focus. Based on your description, you would be a great candidate for the BlueDevil Power Steering Stop Leak (http://store.gobdp.com/power-steering-stop-leak-00232/). You should expect to see results after about 100-200 miles of driving. Will adding the fluid stop noise the car makes when you turn the wheel and is it bad to keep adding fluid to your car instead of getting the pump replaced ? Unfortunately, the BlueDevil Power Steering Stop Leak would not seal leaks coming from the power steering pump. If that is indeed where the leak is coming from, we would recommend having the pump replaced. Can you tell me if I can use BlueDevil on a 2004 Honda Odyssey Minivan? I have a slow leak somewhere and need to add fluid every few weeks. Yes, the BlueDevil Power Steering Stop Leak is compatible with your Honda. We recommend adding 1/3 of a bottle to the power steering reservoir. You can expect to start seeing results after about 100 miles of driving. My 2000 Infiniti keeps dropping past minimum level about twice a week. Not sure if its a leak. It just started about 2 wks ago and have filled it three times since. Do I need to have it looked at by my mechanic? If you are noticing a loss in the fluid level on a regular basis, you more than likely have a leak. Based on how quickly you are losing fluid, we would recommend having it inspected by an ASE certified mechanic. As long as you are not losing power steering fluid too quickly, the BlueDevil Power Steering Stop Leak would be able to help seal the leak in your Chrysler. You should start to notice results after about 100-200 miles of driving. I have a 97 z71 and it appears that my fluid is coming from the steering box and pretty fast! I have herd flour could stop the leak and black pepper but I’m not sure! Will the blue devil work with mine cause mine leaks when parked and driving! Based on your description it sounds like the leak you are experiencing is a little bit too large for what the BlueDevil Power Steering Stop Leak is intended to fix. You would most likely lose the BlueDevil before it would have a chance to work properly. 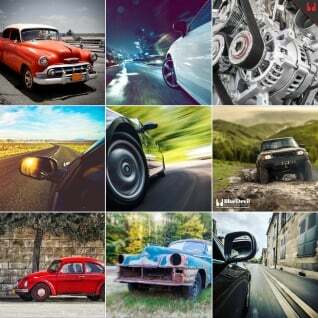 Your best bet at this point would be to make a trip to your mechanic. If you are adding power steering fluid to your vehicle on a daily basis, unfortunately, BlueDevil may not be your best option. From the sounds of it, you are losing fluid a little too quickly, so you wouldn’t be able to keep the product in the system long enough for it to be able to seal. A hard part repair may be your best option in this situation. I just had a terrible automatic transmission fluid leak in my 1999 Lexus Es 300. Bought the power steering hoses and axles front bcuz one axle was messed up. Two days have pass and now I have a tiny leak again .. I told the mechanic he put in the wrong power steering fluid bcuz he used regular one .. that I had the dextron VI auto zone (might be dextron v it’s better than the dextron II/III that manual requires .. since they dnt make the low one no more). He said it was fine .. my man say dnt use stop leak products a mechanic told him that will ruin the engine .. the stuff this mechanic put in my power steering had stop leak I mention that it bad for engine he said power steering fluid won’t bother the engine bcuz it doesn’t go into the engine and its OK to use to stop leak with power steering fluid. In all honesty.. is this true? And in all honesty will your product be ok for my 1999 Lexus Es 300 & stop this small leak? Mechanic did say that car also need top engine mount and stabilizing link both sides front and and the knuckle/joint that attaches to the rack and pinion from the steering column . My man also said it needs the knock sensor n right front blinking socket . Would any of these things cause it to still have a tiny leak when we just fix the hoses ? And will your stop leak be safe not damage my engine or anything on the car but stop the leak ? BTW the car obviously makes the noise when turning if the fluid is low that’s how I knew to check tonight bcuz it just made the noise. Thanks for your question about your 1999 ES300. Your mechanic is correct that the power steering fluid does not run through your engine, and it is safe to use a stop leak product in your power steering system. If the leak in your system is from a hose or connection, BlueDevil Power Steering Stop Leak will not be able to seal the leak, but if the leak is coming from a seal in the rack and pinion then yes, BlueDevil Power Steering Stop leak will seal the leak. The other thing we would recommend doing is using the factory recommended power steering fluid. Dextron II/III is very different than Dextron VI and the wrong fluid could be causing your leaks. if the auto parts store does not carry the proper fluid you can always purchase it from a Lexus dealership. I used your product (Blue Devil Stop Leak) for a leak months ago and has done great for my power steering leak, but it has started to go down not because of a leak, but because it used some over the few months since I’ve use your product. That being said is it okay to remain putting blue devil stop leak into my power steering reservoir or change it to just plain old power steering fluid?? Thanks.. Thanks for your question about your power steering system. If your leak is sealed we would recommend simply topping your power steering system off with the recommended type of power steering fluid. BlueDevil Power Steering Stop Leak is safe to remain in your system until your next fluid flush and doesn’t need to be removed. The BlueDevil Power Steering Stop Leak would not seal a leak coming from the power steering pump. A hard part replacement may be your best option. I have a 2003 Audi A4, I have a power steering fluid leak. I have to refill every week or so, it’s getting annoying and pricey. Is Blue Devil compatible with my car? and is it safe to use on my car? Yes, BlueDevil Power Steering Stop Leak is compatible to us in your Audi A4. You will only need to add 1/3 of the bottle. Once BlueDevil is added you can expect to start seeing results after about 100 miles of driving. I have a leak in my rack and pinion and a leak in my valve cover gasket. I have a honda 2000 accord. Are your products compatible with my car? Yes, we recommend using BlueDevil Oil Stop Leak (http://store.gobdp.com/oil-stop-leak-49499/) for your valve cover gasket leak. The best product for the rack and pinion leak is BlueDevil Power Steering Stop Leak(http://store.gobdp.com/power-steering-stop-leak-00232/); you should add 1/3 of the bottle to your power steering reservoir. Once each of the products are added you can expect to start seeing results after about 100 miles of driving. can i use this to my Toyota sprinter cab 1995? Yes, BlueDevil Power Steering Stop Leak is safe to use in your Toyota. You should add 1/3 of a bottle to properly treat it. Expect to start seeing results after about 100 miles of driving. Thank you for asking about your Dodge Ram. Based on your description, we would recommend using the BlueDevil Power Steering Stop Leak. As long as you are not losing fluid too quickly, you should be able to see some good results from the product. I have a leak in the steering rack of my 2011 GMC Acadia. The dealer says it seems to be a slow leak. Can I use this product in my car to fix the leak? Thank you for asking about your GMC Acadia. Based on your description, we would recommend using the BlueDevil Power Steering Stop Leak. You should expect to see results after about 100-200 miles of driving. I have a slow leak in my toyota corolla 111 gli. I top up frequently than neccesary.Will the Blue Devil stop the problem and if yes is it available in my country Kenya.If not is there an alternative. Thank you for asking about your Kia Sorrento. As long as you are not losing fluid too quickly, you would be a good candidate for the BlueDevil Power Steering Stop Leak. You will be adding 1/3 of the bottle into the power steering reservoir and should expect to see results after about 100-200 miles of driving. My car Toyota Gaia is having power steering leak, am told the seal is worn out its leaking under the engine. Should I add blue devil or what can I do advice please? Thank you for asking about your Toyota Gaia. Based on your description, as long as you are not losing power steering fluid too quickly, you would be a good candidate for the BlueDevil Power Steering Stop Leak. You should expect to see results after about 100-200 miles of driving. Feel free to contact our technical support line at 888-863-0426 with any other questions. This is Brandon and i was wondering if this product would help me with my 1994 chevy silverado. i changed the pitman seal on my truck after it was leaking a bit but after i changed the seals it seamed to drip more constantly and i dont want to take the change in damaging the truck by driving it. But will this product seal my leak??? Thank you for asking about your Chevy Silverado. Yes, the BlueDevil Power Steering Stop Leak would be able to seal the leak you have described. You should expect to see results after about 100-200 miles of driving. Based on your description, unfortunately, it sounds like you may be losing fluid a little too quickly in order for the product to be effective. A hard part repair may be your best option. I have a leak on my Honda Civic 2003. I need to refill the car with ATF at least twice a day. Is my leak too large for this to work? Based on how quickly you are losing transmission fluid we do not recommend using BlueDevil Transmission Sealer. Most likely the product would be lost prior to receiving any benefit from it. We recommend taking the vehicle to a transmission specialist or a Honda dealer. Will this product work on a Mazda Tribute 2000? Yes, we have had success in using BlueDevil Power Steering Stop Leak in Mazda’s in the past. Once the product has been added you can expect to start seeing results after about 100 miles of driving. I have Honda accord (halla) 1993 model but right now the power steering fluid got empty few minutes seem to be a invisible leakage somewhere under the car, please what could be the solution and where does the leaking steering fluid hide? Thank you for asking about your Honda Accord. Based on your description, you may be losing power steering fluid while the vehicle is being driven. Unfortunately, it sounds like you are losing fluid too quickly for the BlueDevil Power Steering Stop Leak to be effective. A hard part repair may be your best option. I have a 2009 RX350 with a very slow rack and pinion leak. Can I just add 1/3 bottle of your leak seal product to the ATF fluid used in the steering system? Thanks! Thank you for asking about your Lexus RX350. Yes, you would use 1/3 of the BlueDevil Power Steering Stop Leak to seal the leak from your rack and pinion. You should expect to see results after about 100-200 miles of driving. I have a power steering leak in my 1998 Nissan Altima GXE would Blue Devil power steering stop leak work? Thank you for asking about your Nissan Altima. As long as you are not losing power steering fluid too quickly, you would be a great candidate for the BlueDevil Power Steering Stop Leak. You should expect to see results after about 100-200 miles of driving. Hi I’m in the UK and have a power steering leak not sure where from . Yes, the BlueDevil Power Steering Stop Leak, found here on our website: http://store.gobdp.com/power-steering-stop-leak-00232/, would be able to stop the leak in your Citroen Xsara Picasso. You will add 1/3 of the bottle into the power steering reservoir and should expect to see results after about 100-200 miles of driving. Hi I have a Mazda 3500 truck. I noticed a grinding whirring noise in steering as I did a hard turn then backed up the drive and reversed into the garage. There was a line of fluid left up the drive and into garage. Have I ruptured something by turning the steering hard? because she has lost so much fluid quickly I am reluctant to fill the reservoir and drive the 3 miles to the mechanic in case it runs dry and I damage the pump. what do you suggest? Thank you for asking about your Mazda 3500. Based on your description, it sounds like a hose may have burst or got disconnected, causing you to lose an abundant amount of fluid. We recommend having the vehicle towed to your mechanic for a proper diagnosis, as it is hard to say whether you would be able to do any kind of steering if you were to drive it there. On my Lexus ES 350 the recommended Power steering Fluid is Dextron III automatic transmission fluid. Will your Blue Devil product work in that fluid as well? Does the Viscosity match? Yes, the BlueDevil Power Steering Stop Leak is compatible and safe to use with your Lexus ES 350 with Dextron III automatic transmission fluid. You should expect to see results after about 100-200 miles of driving. I am having an issue with the power steering fluid leaking in my 2004 GMC Acadia. I got it checked out by a mechanic and he is saying that the fluid is leaking from the gear box. Could Blue Devil stop the leak or could it cause more damage? Thank you for asking about your GMC Acadia. Based on your description, we recommend using the BlueDevil Power Steering Stop Leak http://store.gobdp.com/power-steering-stop-leak-00232/. The product does not harden or thicken in anyway, so it would not have any adverse affects on the system. Hi I have a 57 plate Ford Focus with 60k mikes.. I’ve recently had my power steering pipes & belts replaced as 1 of the pipes burst so they had to replace both pipes but not the pump.. within a week of having it back it started making the noise when putting my foot on the gas.. I took it back, they look over it said it was fine.. so I spoke to a RAC guy and he said it wasnt my pump there was no fluid in it.. bit angry with the garage as they’ve charged me for fluid.. he said they hadn’t bled it through properly now a month later I’ve no fluid in it again so I must have a leak, I saw about 4 spots on the ground in the space of 3 hours.. will this stuff work on my car to stop the leak?? Or should I take it back to the garage and find out why it’s happening? Thank you for asking about your Ford Focus. Based on your description, you would be a great candidate for the BlueDevil Power Steering Stop Leak http://store.gobdp.com/power-steering-stop-leak-00232/. You should expect to see results after about 100 miles of driving. I have a car of Honda accord 2000 LX 4 cylinders. Recently I see there is some drops under the body of my car, I think it is the leaking of power steering fluid. Does Your product work on my car? thanks. Yes, the BlueDevil Power Steering Stop Leak http://store.gobdp.com/power-steering-stop-leak-00232/ is safe and compatible to use in your Honda Accord. You should expect to see results after about 100-200 miles of driving. Thank you for asking about your Mini Cooper. It sounds like a power steering fluid loss is the reason behind your power steering problems. Based on your description, we recommend using the BlueDevil Power Steering Stop Leakhttp://store.gobdp.com/power-steering-stop-leak-00232/. You should expect to see results after about 100-200 miles of driving. I drive a 2006 Honda Accord and my power steering fluid reservoir is leaking I think. I had to put a little in it when I go to work and top it off when I come back. Theres always a small puddle when I drive off. We’ve replaced the O-ring but it’s still leaking. Long as I keep it topped off no noise or whining but I have to put a little in it every time I drive. Will this leak stop help this? Thank you for asking about your Honda Accord. Unfortunately, it sounds like you may be losing power steering fluid a little too quickly for the BlueDevil Power Steering Stop Leak to be effective. Based on your description, you may not be able to keep the product in the system long enough in order to get the benefit of using it. A hard part repair may be your best option. Is the blue devil power steering stop leak compatiable with a 1999 Pontiac grand am? Yes, the BlueDevil Power Steering Stop Leak is safe and compatible to use on your Pontiac Grand Am. You should expect to see results after about 100-200 miles of driving. Thank you for asking about your Mercury Cougar. Based on your description, we do recommend using the BlueDevil Power Steering Stop Leak (http://store.gobdp.com/power-steering-stop-leak-00232/). You should expect to see results after about 100-200 miles of driving. Hi we recently purchased a 2002 Lincoln LS V8 from an auction and noticed an issue with steering. There wasn’t any power steering in it at all so we tried adding some and it ran straight through it to the ground could this fix our problem? Thank you for asking about your Lincoln LS. Unfortunately, it sounds like you are losing fluid too quickly for the BlueDevil Power Steering Stop Leak to be effective. Typically, you would start to see results after about 100-200 miles of driving. Based on your description, it doesn’t seem like you would be able to keep the product in the system long enough in order to get the benefit of using it. A hard part repair may be your best option. Hi, my is Art and I have a 2004 GMC Yukon Denali XL. I seem to have a power steering leak some where in the area of the hydro boost. By using this product will it help stop the leak? Please let me know. Thank you for asking about your GMC Yukon Denali XL. The BlueDevil Power Steering Stop Leak is only intended for the rubber seals/gaskets in the system. If the leak is indeed coming from one of those rubbers, then you would be a great candidate for the product. You should expect to see results after about 100-200 miles of driving. Can your Blue Devil Power Steering Stop Leak be used on my 1995 Mercedes 230 E? Yes, the BlueDevil Power Steering Stop Leak is safe and compatible to use on your Mercedes 230 E. You will add 1/3 of the bottle into the power steering reservoir and should expect to see results after about 100-200 miles of driving. I have a 2000 Lincoln town car and I’m not sure if I need power steering fluid or not but every time I try to turn the wheel it makes a squealing sound and the wheel is almost impossible to turn. Thank you for asking about your Lincoln Town Car. Based on your description, we recommend checking your power steering fluid. If it appears low, the BlueDevil Power Steering Stop Leak (http://store.gobdp.com/power-steering-stop-leak-00232/) would help stop the loss of power steering fluid, and get the system back to normal functionality. I have a 1996 Chevy k1500 4×4. I have put 3 power steering pumps on and both hoses ( & yes o ring is on ) all new and still I have power steering fluid leak. I have washed off every thing underneath but can not find where it’s coming from. Any suggestions????? We recommend applying 1/3 of a bottle of BlueDevil Power Steering Stop Leak to stop your fluid loss. If the leak is coming around any of the rubber seals or gaskets then there is a high probability that BlueDevil will be able to seal it. You can expect to start seeing results after approximately 100 miles of driving. Thank you for asking about your Mercedes Benz MLS350. Based on your description, we recommend using the BlueDevil Power Steering Stop Leak (http://store.gobdp.com/power-steering-stop-leak-00232/). You will be adding 1/3 of the bottle into your power steering reservoir and should expect to see results after about 100-200 miles of driving. 2004 Honda Accord Lx…. I noticed a leak and the fluid in the Power Steering reservoir is low. One of the pump outlet hoses looks wet so i think the leak may be coming from there. Will this product work for leaks to the actual hose? Thank you for asking about your Honda Accord. The BlueDevil Power Steering Stop Leak is intended for rubber seals/gaskets in the system. If the leak is coming from one of the hoses, unfortunately, the product would not be able to help. Replacing the hose may be your best option in that case. I own a Toyota Camry 2000. The power steering fluid reservoir level gets low in every several weeks, and need to fill it up again with ATF Dexron fluid. Leak oil is found on the ground. Please comment if this car can use the product and try to prevent the leakage. Yes, The BlueDevil Power Steering Stop Leak (http://store.gobdp.com/power-steering-stop-leak-00232/) is safe and compatible to use on your Toyota Camry. You should expect to see results after about 100-200 miles of driving. I had a small leak in the rack and pinion. I put the 1/3 of the bottle of BD stop leak in it, now it is either leaking out of the cap or top of the pump. Not sure which it is but it’s dripping down on motor and burning off. Could the stop leak fluid have stopped up a line or something? My vehicle is an 05 Town and Country. Is it possible the system has been overfilled? The BlueDevil Power Steering Stop Leak does not harden or thicken in any way. It is physically impossible for the product to stop up or restrict flow. Please contact our technical support line at 888-863-0426 so that we can get a little better understanding of the vehicle’s condition and be able to make any appropriate recommendations. I drive a KIA Cerato 2006 Diesel 1.5 litre engine. The power steering leak is coming from the power steering oil cooler/radiator which is metal/aluminium. Would you recommend power steering stop leak or radiator and block stop leak. I am concerned with mixing the second fluid with power steering fluid. Thank you for asking about your Kia Cerato. Unfortunately, we do not manufacture a product intended for the problem you have described. Our Power Steering Stop Leak is only intended for rubber seals/gaskets and our Radiator & Block Sealer is only intended for water/coolant leaks. A hard part repair may be your best option. I have a 2001 ford tuarus and it keeps leaking power steering fluid and i was wonder how to use blue devil power steering leak stop. Thank you for asking about your Ford Taurus. In terms of using the BlueDevil Power Steering Stop Leak, you would start by adding 1/3 of the bottle into your power steering reservoir. Top the system off with power steering fluid as needed. Typically, you should expect to see results after approximately 100-200 miles of driving. Is Blue devil stop week compatible with Dexron vi power steering fluid? Yes, the BlueDevil Power Steering Stop Leak is safe and compatible to use with Dexron vi. Feel free to contact our technical support line at 888-863-0426 with any other questions. Hi, can I use this in my 2001 Accura cl type s? I have a small leak in my rack. Yes, the BlueDevil Power Steering Stop Leak is safe and compatible to use in your Acura CL Type S. As long as you are not losing fluid too quickly, you would be a good candidate for the product. Yes, the BlueDevil Power Steering Stop Leak is safe and compatible to use in your Lexus. Feel free to contact our technical support line at 888-863-0426 with any other questions. Yes, the BlueDevil Power Steering Stop Leak is safe and compatible to use on your BMW 320Ci. You will start by adding 1/3 of the bottle into your power steering reservoir, and should expect to start seeing results after approximately 100-200 miles of driving. I have a leak in my power steering pressure hose. Will the product help? Unfortunately, it doesn’t sound like the BlueDevil Power Steering Stop Leak will work for the leak you’ve described. The product is intended for leaks coming from rubber seal/gaskets, such as the rack and pinion. Replacing the hose would be your best option. Could I use this product in my 2010 BMW 550i? Yes, the BlueDevil Power Steering Stop Leak is safe and compatible to use on your BMW 550i. You will start by adding 1/3 of the bottle into your power steering reservoir, and should expect to see results after approximately 100-200 miles of driving. Can I use BlueDevil Power Steering Stop Leak in my Jeep grand cherokee 2014? Power steering fluid in my car is MOPAR MS-11655. Yes, the BlueDevil Power Steering Stop Leak is safe and compatible to use on your Jeep Grand Cherokee. You will start by adding 1/3 of the bottle into your power steering reservoir, and should expect to start seeing results after approximately 100-200 miles of driving. How do I Maintain my Hydraulic System? — How Can I Improve my Gas Mileage?